(Nanowerk News) The nanoelectronics research center IMEC, Hasselt University and the Belgian screen printing company Artist Screen announce the start of their spin-off Lumoza NV. The new company develops and commercializes large area screen printed electronics for the advertising and packaging industry. Foldable dvd-case with electroluminescent animation. Lumoza’s technology for large area screen printed electronics combines electroluminescent ink with a driver that controls the sequence and timing of the animation. 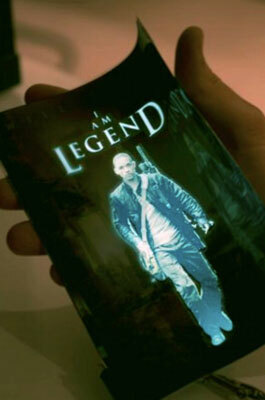 The result is an electroluminescent computer animation that can be printed, just like ink, on all kind of surfaces, for example on a thin plastic foil. And afterwards, folded, rolled up, bended or wrapped. The creation of Lumoza perfectly suits the open innovation vision of its founding fathers: IMEC, Hasselt University and Artist Screen. The innovative R&D activities of Hasselt University and IMEC, combined with the production expertise of Artist Screen offer a perfect harmony between innovation and production. IMEC and Hasselt University have an elaborate track record on printable electronics. Prof. dr. Dirk Vanderzande and prof. dr. Jean Manca have been focusing their research and development on the printability of plastic electronics for several years.. The Belgian screen printing company Artist Screen is particularly experienced in printing on pvc. Artist Screen offers the start-up immediate production capacity and access to two important markets: packaging and advertising. These two markets are ideal for Lumoza since it is immediately able to apply reasonably simple and mature technology.